Chipotle roasted sweet potatoes with seasoned black beans with a spicy swiss chard pesto smothered in ooey gooey melted cheese all grilled in a tortilla until it is lightly toasted and golden brown and crispy. It has been my experience that most things that make good taco filling also make good quesadilla filling and so whenever I make tacos I try to make sure that there are some leftovers to make quesadillas. I mean, you really cannot go wrong taking an already tasty filling and covering it with ooey gooey melted cheese, placing it in a tortilla and grilling it until it is golden brown and crispy! It was with this in mind that I made these sweet potato and black bean quesadillas with swiss chard pesto with the leftovers from the tacos. I kept things nice and simple and filled the quesadillas with the chipotle roasted sweet potato and black beans along with some of the swiss chard salsa and of course, plenty of cheese. As is sometimes the case, these sweet potato and black bean quesadillas with swiss chard pesto turned out to be even better than the tacos that inspired them! 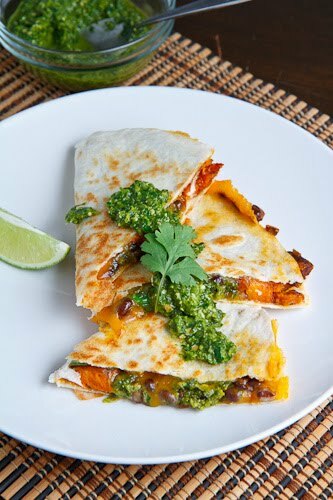 The swiss chard pesto is so good that it is ok to cover the quesadillas in even more of it! Place the tortilla in the pan, sprinkle half of the cheese over half of the tortilla, then top with the chipotle roasted sweet potatoes and chipotle black beans, swiss chard pesto and the remaining cheese. Serve garnished with more pesto and herbs. Ahha! I have some lonely sweet potatoes in the fridge that I was trying to find a new recipe for! This looks awesome, thanks for sharing it 🙂 Hubby and I shall be trying it out later this week. 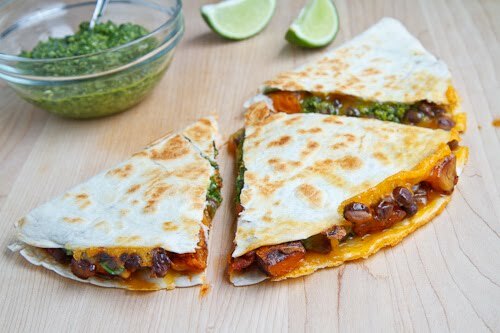 I have been on a total quesadilla kick lately and this one looks incredible! I am loving that pesto. I just posted about a broccoli pesto, it was great and reminds me of this "stray" from the familiar herb pesto here too. Your dishes always make me hungry, this looks so yummy! Love quesadillas. This looks delicious. I love the combination of flavor and color in these quesadilllas. I especially can't wait to try the swiss chard pesto. Beautiful photos too. I love when you show us different ways to use the same base ingredient because it makes leftovers fun! I think I might make the other recipes just for the quesadillas. Lokks delicious! This looks far beyond fabulous. I have a new obsession lately with sweet potatoes and this just looks and sounds out of this world. Must try/ excellent post! Those look amazing, and I think my kids would actually eat them, too! I'm going to try them for dinner tonight. This looks really good, Kevin. I always look forward to your colourful food photos and creative recipe ideas. Keep them coming! I've never heard of swiss chard pesto… but it is pesto and Swiss chard, so it's gotta be good. Love the use of awesome leftovers! You had me at the gooey melted cheese, but the Swiss Chard Pesto sealed the deal. I'm a big fan of sweet potatoes, especially the purple variety. But doesn't the sweet potatoes give the quesadilla a strange strange mushy consistency?? Anonymous: The outside of the quesadilla is nice and crispy and the inside is what you would expect given the sweet potato and bean filling and I quite enjoy it. It definitely has a different texture than a steak or chicken quesadilla but it is inline with spinach quesadillas, corn and black bean quesadillas, zucchini quesadillas or even guacamole quesadillas. I love Sweet Potato especially since it is nutritious. The only thing in the recipe that I have not tried is swiss chard…I love black beans and sweet potato. 2 out of 3 ain't bad! Will give it a try! This looks like a really interesting combo! Still loving the swiss chard pesto. 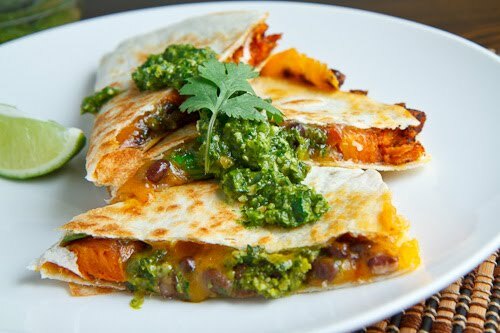 What a wonderful pics of Sweet Potato and Black Bean Quesadillas with Swiss Chard Pesto you have here. Okay WOW. I just saw this last night and made it last night. I fully admit I had little faith in the chard pesto. But I have HUGE amounts of chard that I overwintered and was desperate to use. The chard pesto is incredible! No leftovers! I LOVE this blog! Wanted to pop in and say I made these last weekend for the first time, and they are officially my new favorite meal. I'm making them again tonight. SOOOO. Gooood. Love the combination of flavors, and the pesto? Um, YUM. I made these last night and they were delicious! I especially loved the chard pesto! The flavor combination was awesome! Thank you for sharing such a tasty recipe! Darcy Righello: Glad you enjoyed it! I am so addicted to the chard pesto! Great Recipe! must to try Thanks! Kevin, I am SOooo glad I found you!!! I am vegetarian, and you have some of the most AWESOME RECIPES FOR US VEGIES!. Born and raised in Quebec, I didn't know about jalapenos, etc.. Now I am addicted to hot and spicy food. Thanks, you are the best ! !